Many clients in the custom aluminum fabrication industry today are looking to condense their supplier base. It can become expensive and time-consuming to manage relationships and communications with too many disparate suppliers. At New Age, we understand the benefits of keeping your circle tight and entrusting companies enough to handle manufacturing processes from start to finish. It’s precisely why we offer services that cover the entire fabrication process. It’s also why we insist on providing you the best customer service from industry professionals and why we’re dedicated to getting whatever job you need done, done right. We currently work on custom aluminum fabrication with companies all over the United States and are looking to expand our presence internationally. We have also done work in Europe and are actively pursuing a branching out into Asia in the near future. The companies that we partner with in the US vary in age– many businesses in the industries we serve are reborn through integration with other companies at some point in their lifetime. We serve plenty of organizations who range from thirty to forty years old that have, in all actuality, been around for over a century under various names and partnerships. We work with teams young and old, too. The engineers we see come through the door tend to be younger individuals just pushing into their careers in their thirties; but we also get to talk shop with the industry professionals in their late sixties who are managing these companies. Keeping our thumb on the pulse of these industries through professionals of all ages helps us maintain a strong hold and understanding on where things are at and where they’re heading. We’re different from our competition– and we’re proud of that. As a full-service manufacturer, New Age Metal Fabricators is able to offer nearly every service imaginable to our clients; we’re in control of the quality and timeliness of every project that begins and ends under our roof, and that’s a good thing. We remove the opportunity for details (and even parts) to get lost in translation and are able to guarantee that parts meet our high standards for approval through every step of the fabrication process. Many other custom aluminum fabrication companies have to subcontract things like dip-brazing, painting, or chemical film finishing thanks to regulations that are in place. 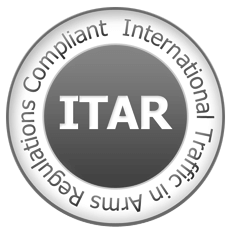 These processes often require strict conditions to be met and certifications to be had. The good news? We have all of that on lock. Our clients rarely need to look anywhere but here for whatever they need done. Every client that comes to New Age is in seek of the same things: custom aluminum fabrication and quality parts at fair prices that are delivered on-time. This is exactly what we’re proud to offer those clients. Because we provide complete manufacturing services, from start to finish, we’re able to closely control and monitor the quality of our parts from beginning to end. The fact that all processes are carried out in-house also afford us the liberty of controlling costs within certain parameters. Our clients value the fact that we can bring them turnkey service; many of them have outright stated that they prefer working with companies who do all of their work in-house rather than having to worry about outsourcing and shuffling good around. We have special approvals in place with BAE and Lockheed Martin that render us the quickest, smoothest stop for custom aluminum fabrication. We are also approved to weld and dip-braze according to NAVSEA, a special Navy requirement and specification. The approval process with NAVSEA is costly, time-intensive, and difficult– our certification means that customers don’t need to worry about those expenses. Those in need of quality customer service to tackle projects also have our engineering team at their disposal. Our team is more than happy to work closely with clients to answer and address any design questions or specifications that may come up. Our thorough and quick customer service sets us apart from other companies in the industry and are greatly beneficial to those who may need some direction in their projects. We have the capacity and capabilities necessary to undertake custom aluminum fabrication jobs that many other factories do not. While we’re perhaps best known for creating small and simple parts, we’re more than capable of tackling complex cabinetry and enclosure projects. 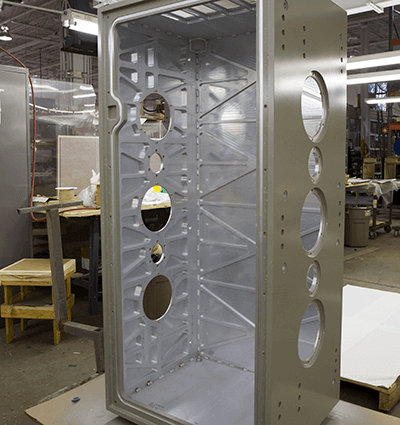 Currently, we’re fabricating 5-foot cabinets that require over fifty separate sheet metal components to be bonded and reverted together– this takes no less than 2500 rivets each! We’re also responsible for painting these cabinets; we have the capacity and the know-how to take on assignments that not everybody else can. With so many manufacturing and custom aluminum fabrication companies popping up, it can be difficult to know who to turn to with a project. At New Age Metal Fabrication, we understand the position you’re in when you start on a project. You want it to be successful– and so do we. Contact us today to speak to an industry professional about your next project. You might be surprised to learn just how much New Age can do for you.